For those that have not used fennel before….remove the stalks from the fennel bulb and any wilted outer layer. Cut off the bottom root end and then cut the fennel in half. Cut out the inner core and then slice your fennel into ½ inch slices. 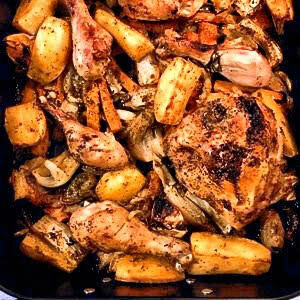 Place on a rimmed baking sheet or roasting pan. Add carrots, garlic, onion, potatoes, and some of the fennel fronds. Drizzle Tuscan Herb Olive Oil over all, and season with Seasonello, pepper, and seasoning, to taste. Toss to coat. Pat the chicken pieces dry and generously season both sides with Seasonello, pepper, and seasoning. Place the chicken in the pan and squeeze some lemon over all. Then add the lemon pieces to the pan as well. Pour the stock or wine around the chicken pieces into all of the vegetables. Roast for approximately 45-50 minutes. I like to broil for the last few minutes to crisp up the skin. Before serving drizzle with some more of the Tuscan Herb Olive Oil.